Ash Ketchum, known as Satoshi in Japan, is a fictional character and protagonist of the anime Pokémon. There are also incarnations of him in the Electric Tale of Pikachu manga, the Pocket Monsters Zensho manga, and the Ash & Pikachu manga. He is loosely based on the male protagonist of the Pokémon Red and Blue. The family name "Ketchum" is a pun of the anime's former tagline and slogan "Gotta catch 'em all!". At the beginning of the series, Ash was 10 years old, and later, in the episode "The Battle Of The Badge", Ash said that it was a whole year since he and Pikachu had visited Viridian City, making him 11. Furthermore, in the short called "Pikachu & Pichu" which was attached to Pokémon 3: The Movie, he said the day when the events depicted in the short took place was the day he met Pikachu, meaning his age at that time would be at least 12. However, two seasons later, the official Japanese Pokémon website reported that Ash was the same age as May, who was 10 years old at the time. This and the fact that the two are at the same height suggests that none of the characters have aged since the show began, placing the Pokemon anime in a floating timeline. Ash is a caring and valiant trainer but he can be confident to the point of arrogance and is known for being stubborn at times. He also has quite the reckless streak, which has led him to troublesome situations and even near death. But when in a Pokémon battle, he is highly competitive, and he shows tremendous presence of mind, taking advantage of the battlefield as well the nature of his and the enemy Pokémon's moves to claim victory after victory, though he has been known to lose from time to time. Ash has matured greatly over the course of the series, and has considerably improved his abilities as a trainer, but his earnestness and determination remain the same. During the first season of the series, Ash trained to catch more Pokémon than his childhood rival, Gary Oak, although Gary has caught more. He soon begins to focus more on each of his Pokémon's abilities. He also impresses many trainers by winning battles in which his Pokémon has a type disadvantage. At the Johto League Silver Conference Ash finally won a battle against Gary. 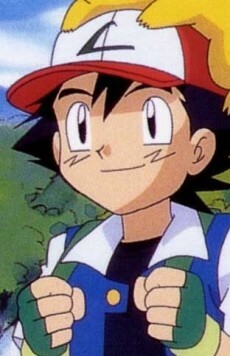 Throughout the anime, Ash has met a number of rivals, including Richie, whom he faced in the Indigo League, and Casey, a diehard Electabuzz fanatic. During Pokémon tournaments, Ash has made rivals out of Harrison, Jackson, Morrison, and Tyson (the last of which went on to become the champion of the Hoenn Pokémon league). Near the beginning of Pokémon: Diamond & Pearl, Ash meets an arrogant young trainer named Paul, who quickly becomes his new rival. Ash's primary nemesis is a group of comical antagonists named Team Rocket. Ever since the second episode, "Pokémon Emergency! ", two Team Rocket operatives named Jessie and James, along with a talking Meowth, have always tried to steal his first Pokémon Pikachu but have always failed. There are some occasions when they work together like the Pokémon: The Movie 2000. Ash's mother is Delia Ketchum (Hanako in Japan). She is a caring and thoughtful woman, though occasionally oblivious as her son, and in the English version of the anime often pesters him to change his boxer shorts every day, a gag throughout the early episodes of the first few series. The identity of his father has remained unknown. One reference to him exists in the anime. During a phone conversation between Ash and his mother in the second episode, she states to her amazement that he got from Pallet Town to Viridian City in one day. "It took your father four days to get there when he started Pokémon training", she says, "He'll be so proud!". A line from the play, Pokémon Live!, suggests that Delia, at one time, had a relationship with the leader of Team Rocket, Giovanni when she was a teenager, but in the anime, no evidence of Giovanni being Ash's father has been shown currently. In the episode "Showdown at Dark City," Ash went by the name of Tom Ato (tomato) after spotting some ketchup that Pikachu was eating. He had to disguise his name, so that his real name would not get a bad reputation, since he was dealing with the rivaling Yas and Kas gyms.